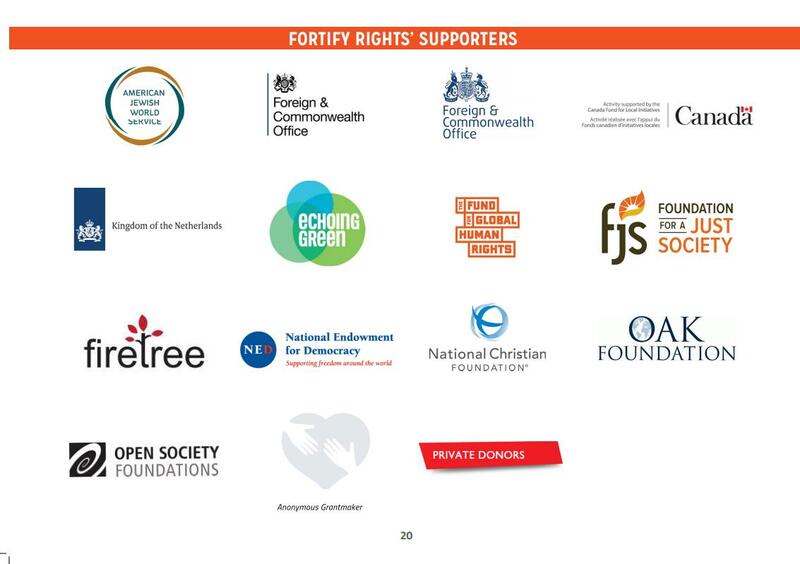 January 4, 2019 (Joseph Thomas - NEO) - Fortify Rights is one of several fronts posing as nongovernmental organisations (NGOs) operating across Asia. Such fronts are in actuality extensions of US and European "soft power." Fully funded by the US, British and various European governments as well as US and European corporate foundations like convicted financial criminal George Soros' Open Society, Fortify Rights positions itself as self-appointed arbiter regarding human rights, democracy and the rule of law at the heart of the sovereign internal political affairs of nations like Myanmar (still called Burma by many Western media organisations and politicians), Thailand, Bangladesh and Malaysia. Recently, Fortify Rights' founder American Matthew Smith announced a new and "exciting" partnership with Doha Debates. Doha Debates is a project of the Qatar Foundation which in turn was founded by the Al Thani family, the unelected rulers of Qatar, a notorious Middle Eastern dictatorship, abuser of human rights and state sponsor of terrorism. The "exciting" partnership between Fortify Rights (a supposed human rights advocacy group) and the Qatari front "Doha Debates" is particularly troubling considering the area of cooperation involves Myanmar's Muslim Rohingya minority. Together, Fortify Rights and Doha Debates are training a group of Rohingya refugees on the basics of photography and Instagram, and we are equipping them with mobile phones to document their lives in refugee camps in Cox’s Bazar, Bangladesh, for an entire year. Through this partnership, Fortify Rights and Doha Debates hope to empower Rohingya refugees to share their stories with the world. 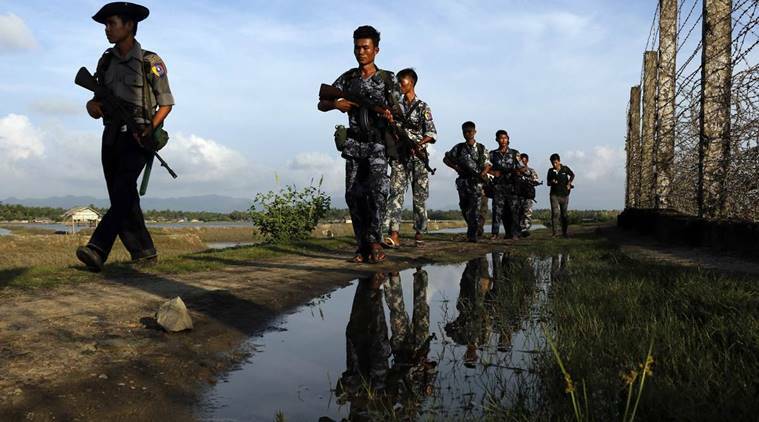 Despite the relatively benign stated nature of this partnership, it is troubling because it signals a possible vector through which money, training and even weapons can pass, behind a "human rights' façade, inflaming already tense ethnic troubles in Myanmar's western Rakhine state. At the very least, influence operations by Fortify Rights and Qatar's "Doha Debates" could be used to further divide communities along ethnic lines while mounting pressure on Myanmar's government and military by exploiting the resulting chaos. 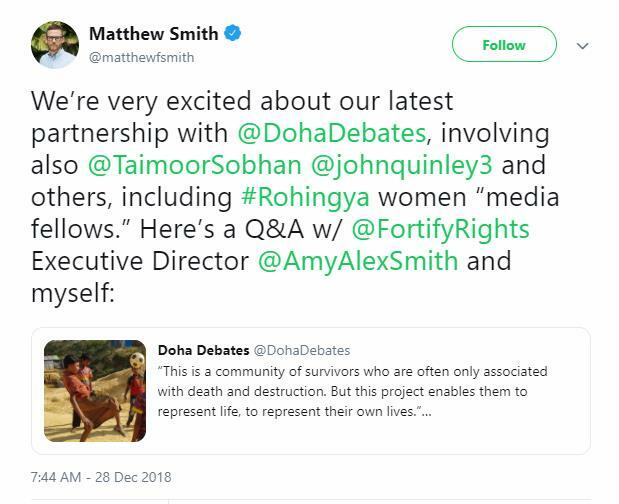 Fortify Rights founder Matthew Smith refused to respond to questions of how his supposed cause of advancing human rights is served by partnering with Doha Debates funded by a dictatorship and notorious state sponsor of terrorism. Smith regularly blocks critics on social media concerned with the nature of his organisation's activities, including many in Myanmar whom he claims he's "helping." Qatar wouldn't be the first Gulf nation to involve itself in the ongoing Rohingya conflict. Saudi Arabia is also involved, hosting the self-proclaimed leadership of a Saudi-backed and armed Rohingya militant group that has launched deadly attacks against Myanmar's security forces. Just as the US and it Gulf allies have created cadres of terrorists to unleash and sow chaos in other targeted countries, to then intervene either institutionally or even militarily, it appears a similar game plan is long underway in Myanmar. As extensively covered in the past, fronts like Fortify Rights seek to undermine and eventually overwrite the independent institutions of each respective nation it operates in, in favour of US and European funded institutions that answer to American and European interests. Such groups, funded by foreign interests, presume authority of a nation's legal structures and policy making, demanding sovereign governments to enforce or even change their nation's laws to serve Western interests. Failure to do so results in threats of being passed over to "international institutions" like the International Criminal Court (ICC) and even the UN where the US and Europe are easily able to pass resolutions politically damaging to a targeted country. Such resolutions often pave the way for more concrete measures like economic sanctions. This form of institutionalised coercion is the face of modern-day imperialism. Fortify Rights' activities include exploiting political and ethnic fault lines in order to sow division in targeted nations. It intentionally omits the role its own financial sponsors have played in fomenting ethnic violence and instead shifts the blame on the targeted government. In Myanmar, for example, Fortify Rights is exploiting the ongoing Rohingya crisis to place pressure on both the nation's government and its military. The goal is to increase the presence of Western organisations and governmental missions and reduce Myanmar's ties with neighbouring China. By pivoting Myanmar and its vast human and natural resources away from China and back toward its former colonial masters, the country can be transformed into a springboard to project similar disruptive influence into neighbouring Southeast Asian countries. In fact, Fortify Rights has already expanded its activities into neighboring Thailand and Malaysia and is increasingly involving itself in Bangladesh's internal political affairs as well. Its partnerships with major US and European media organisations allows its US and European government funded agenda to be spread to larger international audiences. Its partnership with Qatar, a nation notorious for its global sponsorship of terrorism, may signal a new level of interference in Asia's sovereign affairs and even constitute a threat to regional security. Qatar was just one of several Gulf intermediaries that funneled weapons, cash, equipment and training to terrorists fighting in Syria as part of the US Central Intelligence Agency's (CIA) Operation Timber Sycamore. 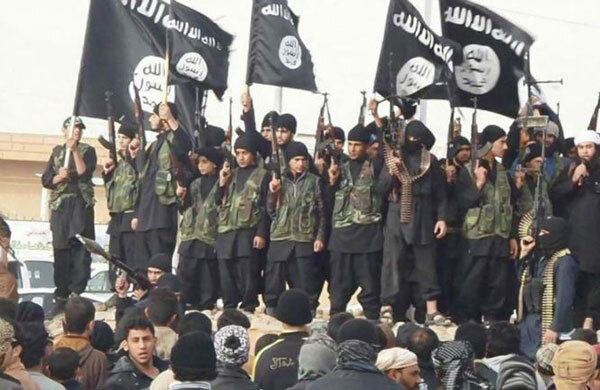 While the US media attempted to portray the recipients of these arms as "moderate rebels," the truth is virtually all of the weapons went, very intentionally, into the hands of extremists like Al Nusra and even Daesh, also known as the Islamic State in the Levant (ISIL). We know this because Qatar is admittedly a partner in the CIA's Timber Sycamore programme and has also been elected as the scapegoat for the torrents of weapons and cash from the programme ending up in terrorist hands. The Telegraph's 2014 article, "How Qatar is funding the rise of Islamist extremists," would report on Qatar's foreign policy without mentioning its role in the CIA's Timber Sycamore programme. ...Qatar has deliberately channelled guns and cash towards Islamist rebels, notably a group styling itself Ahrar al-Sham, or "Free Men of Syria". Only last week, Khalid al-Attiyah, the Qatari foreign minister, praised this movement as "purely" Syrian. He added that its fighters had suffered heavy losses while combating the Islamic State of Iraq and the Levant (Isil), the group behind the murder of David Haines, the British aid worker, and which is holding John Cantlie and Alan Henning hostage. Far from being a force for moderation, Ahrar al-Sham played a key role in transforming the anti-Assad revolt into an Islamist uprising. Its men fought alongside Jabhat al-Nusra, an al-Qaeda affiliate, during the battle for Aleppo and they were accused of at least one sectarian massacre. Instead of fighting Isil, Ahrar al-Sham helped the jihadists to run Raqqa, the town in eastern Syria that is now the capital of the self-proclaimed "Caliphate". In reality, these weapons were always meant for terrorist hands. The US and its Gulf partners as well as Turkey set out from the beginning to empower the worst elements both within Syria and beyond its borders, importing terrorists the coalition hoped would shatter the Syrian state as similar methods did in Libya. In this sense, then, we shouldn't be surprised to find a US and British government funded front like Fortify Rights now partnering up with Qatari organisations to leverage ethnic violence in Myanmar where the US and its Gulf allies are also trying to introduce extremists to exasperate violence. That Fortify Rights is expanding its activities not only in Bangladesh and Myanmar where the conflict currently straddles, but also neighbouring Thailand and nearby Malaysia, may signal attempts to create a pipeline of destabilisation across South and Southeast Asia. Just as chaos in the Middle East has served as a pretext for decades of US military intervention, invasions and enduring occupations, similar violence in Myanmar is already creating opportunities for the US to assert itself. Fortify Rights is not alone. It is just one front in a large network of organisations meddling behind the pretext of everything from law and democracy promotion, to human rights and environmentalism. Their goals vary from obstructing regional infrastructure projects built in cooperation with China, to organising protests and destabilising governments. Seeing past their façade and examining their troubling and indefensible ties to foreign dictatorships and state sponsors of terrorism, and alerting the public to the danger they pose to national security, helps strip away the protective status of legitimate NGOs they hide behind allowing them to be held accountable and purged from the region.